The Chairman of the Independent Corrupt Practices and Other Related Offences Commission (ICPC) Professor Bolaji Owasanoye has urged the National Assembly to remove the secrecy surrounding its budget for the sake of transparency. Professor Owasanoye spoke during a lecture at the 9th National Assembly Induction Programme for new legislators, held in Abuja recently. 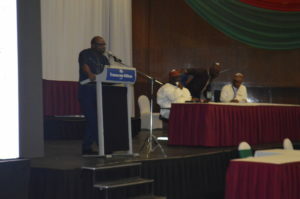 In the lecture titled ‘The Legislature and Fight against Graft and Corruption’ ICPC boss who spoke on the alleged outlandish allowances of members of National Assembly and the controversial issue of constituency projects said that the public perception of legislators as being corrupt would not go away until the National Assembly throws open its yearly budget to the public. He stressed that the execution of the National Assembly budget which has grown exponentially from N6.9 billion in 1999 to about N139 billion in 2018 for the same number of legislators has remained shrouded in secrecy thereby giving room for allegations of abuse and misappropriation of the funds. He said, “It is believed that we have the highest paid legislators representing the poorest people in the world. Since 1999, NASS Budget has increased without defensible legal or moral justification. Without increase in membership and addition of only one or two agencies, NASS budget grew from N6.9 billion 1999 to N139 billion in 2018. Professor Owasanoye described corruption as the enemy of development and good governance and the biggest challenge to Nigeria’s development, adding that the Legislature must wake up to its role of oversight over Ministries, Departments and Agencies (MDAs) to curb the menace. Turning his sight to the Executive arm of government, he said that corruption thrives more in the Executive than the Legislature and the Judiciary. The ICPC boss based his assertion on the fact that the aggregate budgetary allocations to MDAs year by year was more than that of the other two arms combined, thereby allowing corruption to thrive. 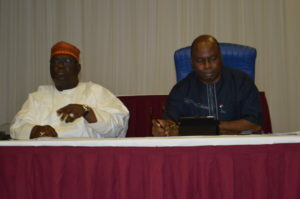 Owasanoye also said he took exception to the way National Assembly conducts its statutory oversight on MDAs, noting that asking government departments and agencies to fund the oversight was inappropriate. He enjoined the 9th National Assembly to move away from the presumed norm and chart a new course which will, in the long run, aid the fight against corruption even as he reiterated the readiness of ICPC to work with the in-coming Legislators. Some senators and members of the in-coming 9th National Assembly also spoke at the event including the Majority Leader, House of Representatives, Hon. Femi Gbajabiamila, who told the gathering that he had canvassed for a complete disclosure of the budget of the National Assembly to put an end to the numerous accusations of corruption being leveled against them. He also spoke on constituency projects saying that monies were never given to them directly but that the concept was for members and senators to point out the projects to be executed in their constituencies to MDAs who are the ones to carry out the implementation.